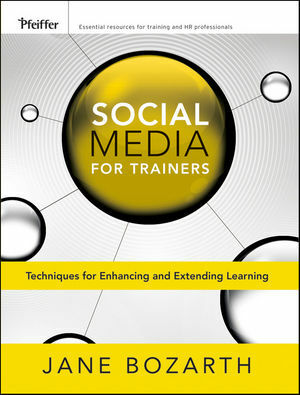 This is the 9th stop of the Blog Book Tour for Jane Bozarth's new book, Social Media for Trainers. Needless to say, I am extremely proud to be a part of the tour and to have been invited by Jane Bozarth to add my thoughts along with thought-leaders and stalwarts in the field. Jane Bozarth, in her usual inimitable style, makes the difficult easy. I am not saying SoMe is difficult to grasp or use—but then I am quite an active user and already sold on its advantages. There are many I know for whom SoMe is either incomprehensible or perceived as time and effort wasted. This book addresses the sceptics, the doubting and the uninitiated as well as those experienced in using the tools. Jane has the rare capacity of inspiring one to actively try out what she is recommending (I had the same feeling when I read e-learning Solutions on a Shoestring), she makes it that simple. This book is a case in a point. In this book, she “breaks down” the components of each SoMe tool, clarifies when these can be best used, how to use them and, most importantly, why. With her focus on the main tools that have grabbed “global imagination” namely, Twitter, Facebook, Blogs and Wikis, Jane Bozarth writes a lucid, eminently readable account of what technology has to offer in terms of Social Media tools and their position in the sphere of learning. By demonstrating SoMe tools as a natural, positive and much needed evolution and extesnion of the way we do training, and not a radical revolution that requires throwing away of years of accumulated experiences, she ensures that trainers with zero experience in using these tools will also feel comfortable in deploying them, and view them as a means to achieve the end more effectively and engagingly. Probably one of the most important uses of SoMe is the ease with which it allows a trainer, an organization L&D department, a learning analyst/strategist/consultant include formative and summative evaluations, and “stretch” the course—preventing it from becoming another classroom event that is soon forgotten. How often do we get to know how the learners are faring once a course has been delivered and they have gone back to their work schedule? Hardly ever. Whether as trainers or performance consultants, we never get to know the results of our labor. SoMe can remove that barrier by improving accessibility and engagement. Today, a trainer/ID/L&D director can ask a group of learners on Facebook or Twitter (or any other micro-blogging service that operates within the company firewall if security is an issue) how useful they find the course, what do they like or dislike, which aspects are most relevant to their real work, what could be removed, and so on. Imagine the efficacy of such training! Imagine the ROI in this case. There is direct data available to show the impact (or lack thereof) of the training on employee performance. And a training “event” can stretch and evolve into a community of practice, bridging distances and overcoming silos…think about it!!! There are exciting times ahead for trainers. The forgetting curve will may not be able to do its job so effectively with SoMe to deal with. With tons of examples to get trainers started off in using SoMe for training, this book is a more of a DIY than just a book explain SoMe and its advantages. Examples of how to start, sustain and invigorate discussions in different platforms are discussed in depth. She even adds a tip on how to start a You Tube video at a desired point by adding a code snippet. GroupTweet If you want to manage your class as a private unit, a free tool from www .grouptweet.com will convert a standard Twitter account into a group space where members can send tweets to everyone in the group using direct messages. When this group account receives a direct message from a group member, GroupTweet converts it into a tweet that all followers can see. New Twitter tools appear all the time, so search the web for other similar products. Aside: I thought was using Twitter quite effectively…absolutely not said the book (my learning from it rather)!!! There are possibilities I have not even explored. Thanks for the book, Jane and for continuing to share your knowledge, experience and passion. An instructional designer and performance consultant, with past experience as a classroom trainer and a long-time facilitator of virtual classes for adult, Japanese learners learning English as a Foreign Language (EFL), I can easily appreciate what Jane writes. I taught EFL to Japanese learners much before the advent of Twitter or the popularity of Facebook climbed the charts. But we used forums, discussion threads and wikis to communicate, collaborate and evaluate the assignments. Even though we had never seen each other, we managed to create strong bonds that helped us to communicate and collaborate. I can vouch for the efficacy of these modes of learning, if used correctly.